Are you a fan of the Narnia chronicles? This embroidery design will be a powerful inspiration for your next project then! It features a lion from Narnia embroidered in a stunning combination of twilight, aspen white, black, saturn gray and traditional grey. This powerful and noble animal is rightfully believed to be one of the most beautiful in the whole of nature. Use this motivational design to enhance your favorite items such as workout outfits, hoodies, sweaters, pajamas, T-shirts, travel accessories and much more. The needlework is compatible with all sorts of suitable fabrics. My daughter is a fan of Narnia and it's great that you've digitized King Lion! Downloaded the design to my cart. Will surely use it. Later a bit) THank you! Great seller. Perfect stipple. I tested one design on cotton and love the way it turned out. I especially like the low speed that is set. NO THREAD BREAKAGE!!! 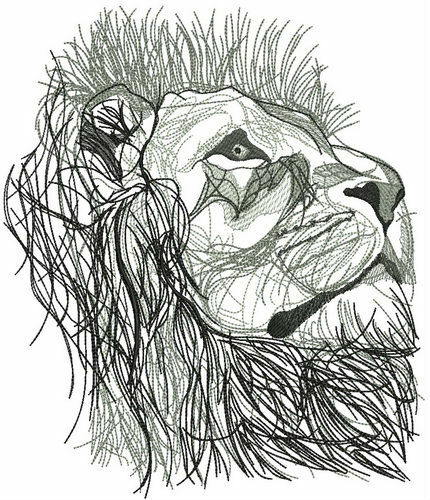 Ordered the Lion pattern for a pillowcase. Turned out ideally on my Janome Memory Craft 6700P. I think it also would be great on clothes. Thanks to the designer for his job! Great stitching. Thanks. A very unusual style of embroidery. 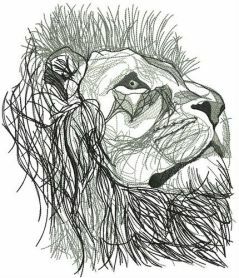 It was a bright idea to digitize the lion portrait) Happy about the purchase!!! This was super easy to download and turned out beautifully on my Brother 1000 machine. LOVE IT! Great digitizing.